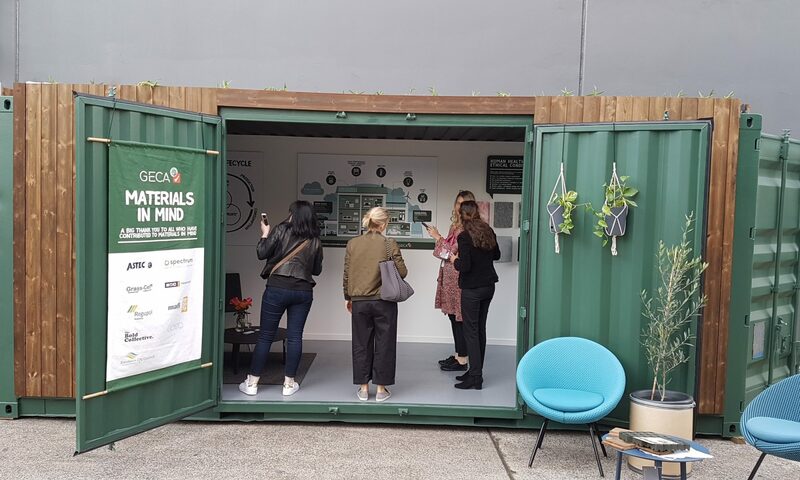 The GECA ‘Materials in Mind’ pod is an interactive showcase of beautiful and functional GECA Certified building materials and furniture, all inside a uniquely repurposed 20ft (6×2.2m) used shipping container. Visitors can interact with the pod via the built-in educational elements, which outline the key environmental, health and social issues associated with different building materials. Materials In Mind was first launched at Sydney Indesign, and was very popular with visitors to the event. “Visitors loved the design and look of the container and enjoyed the interactive elements of learning more about what environmental, health and social criteria to look for in a material or product,” said GECA’s Marketing Manager, Paula Clasby. Throughout the built environment and interior design industries, there is an increasing focus on the environmental impact, social responsibility and the safety of products and materials. A transparent, ethical and sustainable supply chain is essential for manufacturers in today’s industry – but how can architects, specifiers and consumers know which products are best? The interactive showcase of sustainable building materials regularly travels to exhibitions and events throughout the year. To keep up to date with where you can next see the pod for yourself, subscribe to our monthly newsletter. GECA would like to thank all involved in the creation of Materials in Mind, including Kebony, Astec Paints, BGC Plasterboard, Spectrum Floors, Grass-cel, Regupol, Zenith Interiors, The Bold Collective, Caen Creative and Randwick City Council. Green Roof System – Grass-cel by Grass-cel.